This English company was founded in 1759 by Josiah Wedgwood, a legend when it comes to developing artistic ceramics. It's also interesting to note that was the grandfather of evolution theorist Charles Darwin. Wedgwood’s influence was so profound in his field, in fact, author Frank Farmer Loomis IV aptly calls him the “Chippendale” of the china industry in his book Antiques 101. In the mid-1700s when Wedgwood was first doing business, everything was handmade the old fashioned way using a potter’s wheel. And while physical limitations kept him from throwing pottery, for the most part, he focused instead on manufacturing and perfecting designs as an astute businessman. He set his sights on producing china, previously only available to the very wealthy, that was of high quality but affordable as well. That doesn’t mean that the affluent weren’t fans of Wedgwood’s quality work. 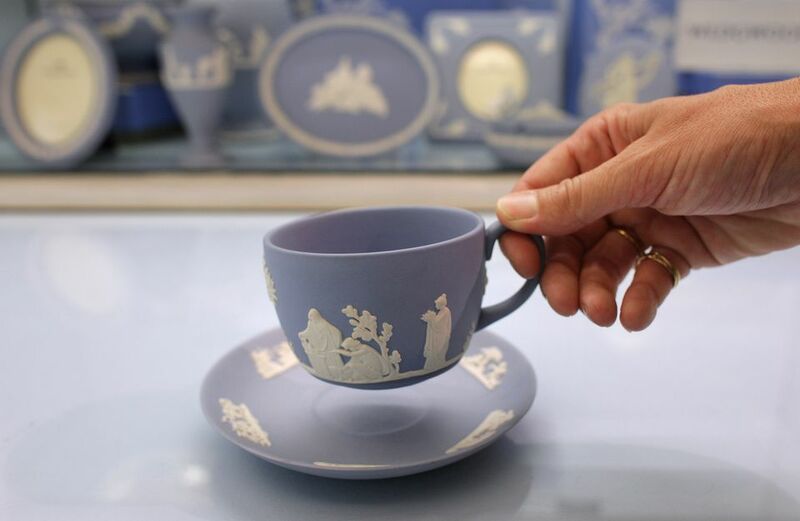 Wedgwood partnered with Thomas Bentley, a well-traveled merchant from Liverpool, England in an affable way as the two were not only business partners but also great friends. In 1768 the duo opened a showroom in London that catered to the wealthy. Among his clients was Queen Charlotte, whom Wedgwood’s famous “Queens Ware” was named. The Empress Catherine of Russia also bought a Queen’s Ware set to serve fifty people, which equates to 952 pieces, now on display in St. Petersburg, Russia, at the Hermitage Museum, according to Antiques 101 and the Wedgwood retail website. The Vatican, White House, and many prestigious hotels have also owned and used this esteemed tableware over the years. For several years Wedgwood worked on perfecting porcelain that would eventually be called Jasperware. In 1774, after experimenting tirelessly, he finally got it right. This porcelain was named for the semi-precious stone it resembles – jasper. It is an unglazed vitreous stoneware made in a number of different colors including the famous Wedgwood blue that has become synonymous with Josiah’s family name. Other colors include green, yellow, lilac, black and white. Neoclassical influences popular at the time led Wedgwood to decorate these pieces with white Grecian figures in relief. Jasperware was immediately popular and remains in production even today using original molds. The Wedgwood factory is now located in Barlaston, England. Along with Queens Ware and Jasperware, Black Basalt was one of Wedgwood’s most popular innovations, according to the company’s website. It was made with reddish brown clay to which manganese was added so that it turned black during firing leaving a body with a deep sheen perfect for decorating with colorful paints. The shapes and décor were inspired by ancient Greek and Italian wares. Wedgwood developed this product in 1767 and originally called it “Black Basaltes.” He said of the new wares, “Black is Sterling and will last forever,” according to the Wedgwood museum. Josiah Wedgwood II oversaw bone china production between 1812 and 1822. It was revived again in 1878, according to Warman’s Antiques & Collectibles edited by Noah Fleisher. The Wedgwood product was akin to other English bone china producers such as Coalport, Spode, and Worchester. Luckily for majolica lovers, pieces made by Wedgwood are indeed marked making them easily definable. These wares competed with other majolica manufacturers of the day and were made in response to the demand for colorful decorative arts in Victorian England beginning around 1860. Clement Wedgwood is responsible for the development of new glazes that made majolica production possible. Wedgwood has also made transferware for decades, including many commemorative pieces. One such blue and white plate were sold in conjunction with the Texas Centennial in 1936, in fact. They were also known to produce flow blue wares in the mid- to late-1800s. The Beatrix Potter illustrations on the Peter Rabbit collection also remain popular today. Many well-known artists designed for Wedgwood throughout its long and varied history.